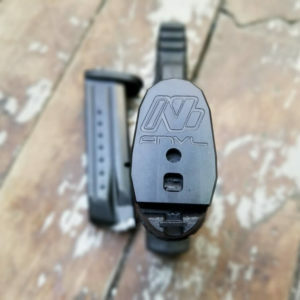 ANVL CZ-USA P-10C baseplate is a great way to elevate your EDC gun’s function without sacrificing concealment and printing. Manufactured from 6061 Aluminum with Level III Hard Coat anodizing , these baseplates can handle abuse. The baseplates are lightweight and robust. They add weight to the bottom of the mag, for faster reloads. They are taller than factory for easy stripping if there is a magazine stuck malfunction. More durable than factory baseplates that are polymer and can get brittle over time. They also fall into a smaller footprint than the factory so that it fits the EDC magwell. 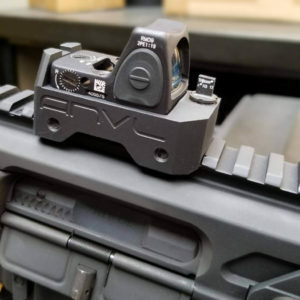 ANVL UKON is a micro Trijicon RMR rifle mount that incorporates a single focal plane absolute cowitness backup iron sight package. It utilizes a standard type AR-15 adjustable front sight post. It has the ability to adjust elevation. The user can adjust elevation to be point of aim, point of impact for subsonic rounds while still running the red dot for super sonic and vice versa. 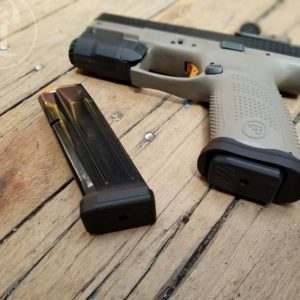 It can be used as an absolute cowitness as well for a backup if the red dot fails. Because it is a single focal plane, and it is so close together for a sight picture; the irons actually act like a backup red dot. The mount is constructed from 6061 aluminum with a 7 Series hard coat. 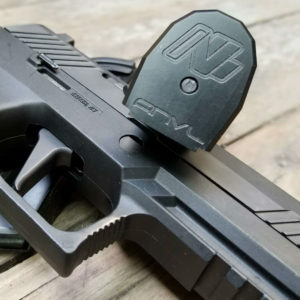 ANVL CZ-USA P-10C Magwell and baseplate combo is a great way to elevate your EDC gun’s function without sacrificing concealment and printing. Manufactured from 6061 Aluminum with Level III Hard Coat anodizing , this magwell and baseplates can handle abuse. It increases the magwell entrance area significantly while still following the factory molded-in magwell flare. The magwells are lightweight and robust. We decided to pair this with two of our ANVL Minimalistic Baseplates. They add weight to the bottom of the mag, for faster reloads. They are taller than factory for easy stripping if there is a magazine stuck malfunction. More durable than factory baseplates that are polymer and can get brittle over time. They also fall into a smaller footprint than the factory so that it fits the EDC magwell. Glock Carry Baseplates made 6061 Aluminum and 7 series hard-coat. Designed to be an OEM replacement. 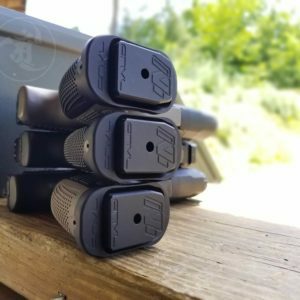 ANVL P320 Magwell is compatible with the current FULL SIZE, CARRY and COMPACT.MEDIUM sized grip modules only. Will only work with 15 & 17 round mags with ANVL Weighted base plate or SIG 21 rnd mags. 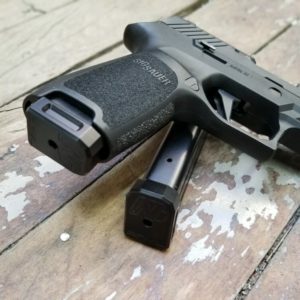 DOES NOT FIT XCarry grip modules. Easy install, press on with a single rear screw that installs flush to the magwell. Constructed of 6061 Aluminum with a 7 series hard coat anodizing. Elevate your reload accuracy with the ANVL P320 Magwell. Do not overtighten the screw. Apply a small drop of blue Loctite to the screw before installation. Finger tighten the screw with the Allen key. Once finger tight, only do a quarter to half turn to ensure adequate tightness. M&P Baseplate made 6061 Aluminum and 7 series hard-coat. 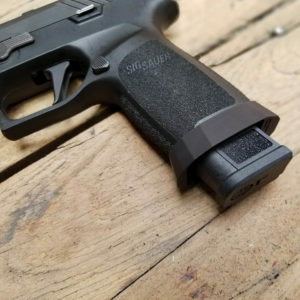 Design to fit both gen 1 and 2.0 type magazines and spring followers. 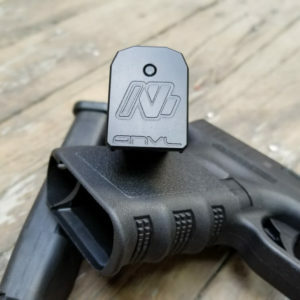 M&P baseplate is slightly extended forward to help capture the user’s full grip. Sig Sauer P320 Carry Baseplates made 6061 Aluminum and 7 series hard-coat. Designed to be an OEM replacement that fits into the contours of the grip module. Compatible with only Gen 1 circle peg spring follower. Sig Sauer P320 Weighted Baseplates made 6061 Aluminum and 7 series hard-coat. Designed to fit both circle peg spring followers and well as the 21-round rectangle peg spring followers. *Note: Rectangular peg spring followers may need slight modification of spring follower. Removal of 2mm plastic from the front of the spring follower may be needed. © 2017 ANR Design LLC | All rights reserved.